A trio of Seattle’s Top Chefs: (from left) Jerry Traunfeld, Maria Hines and Thierry Rautureau. Going up against a team of masters, the Seattle sensations are vying for a shot at the prize: $100,000 to the charity of their choice. “These days, you’re either on a reality show or you know someone who’s on a reality show,” says Jerry, who you’ll find on the (very) small screen right here. His designated charity? — the International Gay & Lesbian Human Rights Commission. Maria will be a familiar face on small screens everywhere even before she makes her appearance on Bravo. Stay tuned for her February 25 show-and-tell on “The Martha Stewart Show,” where she’ll stand and deliver a spot-prawn dish, giving the nod, as always, to local fishers, farmers and foragers. Her charity, should she win the coveted “Masters” slot? PCC Farmland Trust. 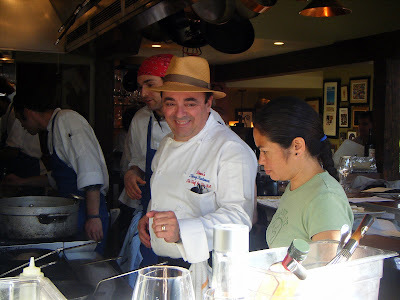 Thierry and Maria at play in the kitchen — last year at Seattle’s Harvest Vine. So, who among this award-winning trio has the brio? We’ll see soon enough. The first show airs Wednesday, April 7 at a ridiculously late 11 p.m., before moving to its regular 10 p.m. time-slot.